Pete Byron Howard obituary. Carnes Funeral Home. Aug 1, 2013 Lit by ~ Patti Z.
Aug 1, 2013 Daddy, I really miss you but try to find comfort in knowing you are in a better place. May you rest in peace. Patti Z.
Peter Byron Howard (Pete) passed away July 29, 2013 in Webster, Texas. He was born in Galveston, Texas on May 25, 1920. He was preceded in death by his parents Mary (Lawrence) and A.E. Howard. His brother Robert N. Garvey and sister Sadie Mae Underwood. Infant son Peter B. Howard Jr and two great grandchildren Elijah and Hope Novella. He is survived by his wife of 67 year Sarah Katherine (Oldham) Howard. Three daughters: Linda J. Webster of Altoona, Pa. Mary P. Zimmerman (Frank) of Texas City, Texas, Becky Ruth Bailey (Renea Medlin) of Alvin, Texas and one son Byron G. Howard Sr. (Rosie) of San Antonio, Texas. Pete was the proud Papa to 12 grandchildren: Trey Zimmerman, Michael Zimmerman, Kym Howard, Byron G. Howard Jr, Michelle (Howard) Zaleski, Jennifer Howard, Sarah Bailey, Benjamin Bailey, Mia Kline, David Popoff, Faith Trout-Novella and Josef Ortiz. 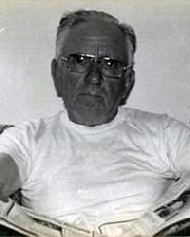 He was Papa to 15 great grandchildren and numerous nieces and nephews. Pete grew up on Galveston Island where as a young man he began developing a promising amateur boxing career. He joined the Marine Corp on March 5, 1940 and served honorably until October 14 1943 when he was placed in the USMC Reserves. He served in the South Pacific from May 1942 to May 1943. He fought at Guadalcanal and in the British Solomon Island. He then joined the Merchant Marine and served honorably until 1947. He married Sarah (Kay) Oldham in November 1947. They resided on Galveston Island and in La Marque where Pete worked delivering Pearl Beer for many years then as a longshoreman off- loading banana boats, then as a security guard for the La Marque ISD and retired to tend bar at VFW 8248. Among his hobbies playing cards with his friends at the Elk’s Lodge and the VFW topped the list. He was a lifelong fisherman and made some of the best Texas barbeque. He was proud of his ball cap collection and loved swimming and diving off the high board at the old 23rd and Seawall public pool. There will be a memorial service on Saturday August 3, 2013, at 2pm at the La Marque VFW 8248 located at 901 Main Street, La Marque, Texas. The family requests that in lieu of flowers donations be made to The Wounded Warrior Project or the charity of your choice.